Bayern Munich right-back Rafinha has apologised for dressing up as an Arab holding what appears to be a box of explosives at a Halloween party. 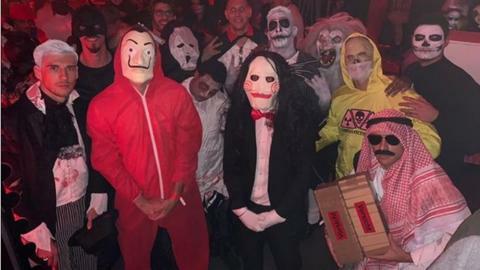 The German club's official Twitter account posted a picture of several players, including Brazilian Rafinha, wearing fancy dress on Wednesday. The tweet was later taken down. Rafinha reposted his apology after initially using a picture of him in the costume. "Halloween is a scary celebration with exaggerated costumes," he tweeted. "It was not my intention to anger anyone through my disguise or hurt someone's feelings." The 33-year-old was dressed in traditional Arab clothing and holding a box labelled 'Vorsicht' - the German word for 'caution'. Bayern, who have been crowned German champions in each of the past six seasons, tweeted the picture to its 4.51m followers.